For a few months now James Dumar has been training two of our Villagers at our Center, both CHOICE staff, and keen to learn the art of Beekeeping. CHOICE has given them an interest free loan to purchase a hive each, repayments will be taken from their salary. They can choose to either extract honey to sell or double their number of hives, say each 3 months. We hope with enough training LaoHeng will become the assistant teacher and manager of our Bee Co-Op in the future. 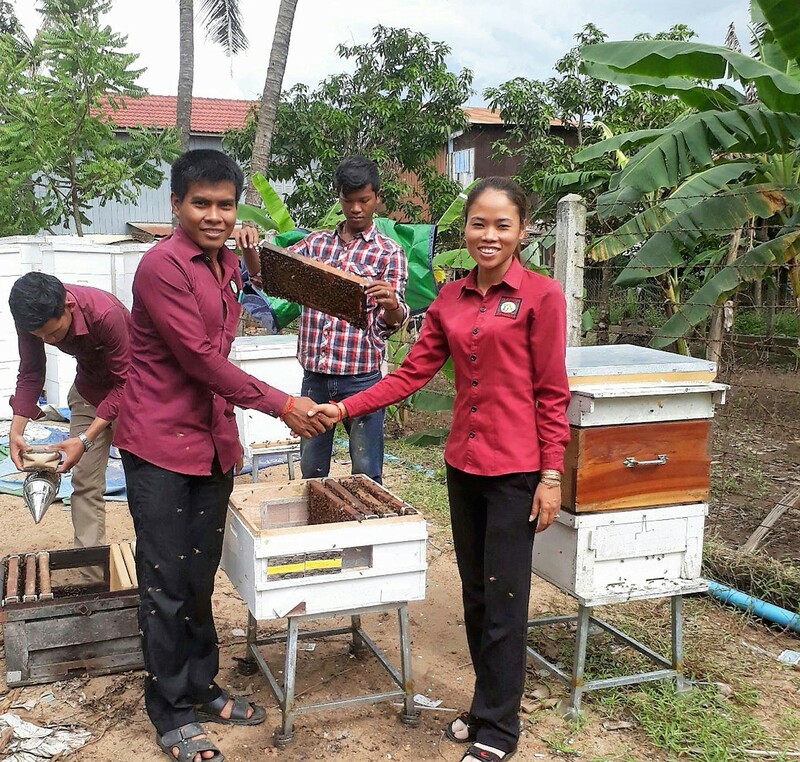 On the bottom is Sokheng with Vanny and on the top is LaoHeng receiving their hives fro Ross. CHOICE finally has a place to call home. After many years searching, we have finally purchased suitable land. Bigger than our current Center area, its approximately 28m x 137m. located nearby and on the Bassac river, and at a bargain price. The purchase on 31st May 2017 was made possible by CHOICE Family Germany, we thank Michael Wieland for obtaining a non-interest loan for our NGO, repayable in 5 years. Maybe a struggle at first for repayments but in the long term a savings of around US$7,000 pa. in rent. As CHOICE has no money to develop the land I personally pledged to donate US$10,000 as a start towards amenities. Then Don Rosenfeldt gave US$14, 686 (AUD$20,000) and other groups and friends have made promises for financial support towards the development, absolutely amazing. All these and other large financial supporters will be acknowledged on site with written sign-age. We have plans to divide the land into 3 separate areas, the biggest area at the road end will be the school. This will be developed in stages over the next 4+ years. The first stage being the relocation of the Kindergarten and building the necessary amenities, hopefully completed this year 2017. The second area in the middle will be for Khmer training and accommodation for those Khmers whilst in training. We have acquired the services of a training instructor, James Dumar. 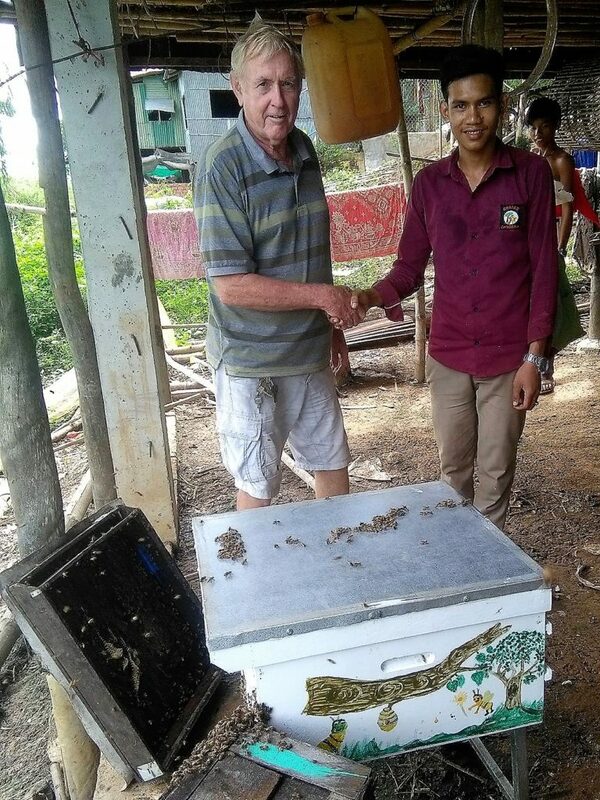 James is living at the CHOICE Center and is Co-ordinating the Bee-keeping program free of charge to our Khmer people, further courses will be introduced as the new facility develops. Development in this area is to start this year. The third area will be mainly for Western accommodation. We intend to lease this area to a supporter of CHOICE Don Rosenfeldt, he will build a Guest House overlooking the river. Don will donate all profits from this to CHOICE. We will be able to offer accommodation to volunteers, visitors and regulars that are sick of travelling out daily on the minibus. To prevent visitors from wandering into the School area a security fence will be erected between area 2 and 3. This will also keep the children away from the river. There are future plans to run a boat from Phnom Penh to the new center and return. We have also acquired the services of the Gordon TAFE Geelong, they will send a team of tradesman each year to help train, build and landscape the Center. We thank you all, groups and friends for pitching in. Honorary Secretary Ross Wright.